(Washington, D.C.)—The United States Mint is pleased to announce the appointment of Kareem Abdul-Jabbar to the Citizens Coinage Advisory Committee (CCAC). Mr. Abdul-Jabbar fills the vacancy created this year by the resignation of Steven Roach, a member representing the interests of the general public. 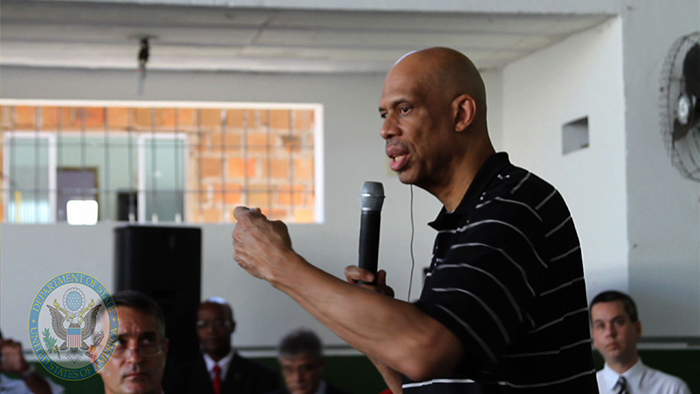 Mr. Abdul-Jabbar, a renowned former professional basketball player who is an avid coin collector, became interested in numismatics based on his love of history and his study of Alexander Hamilton. Currently, he serves as the chairman of his Skyhook Foundation, whose mission is to “Give Kids a Shot That Can’t be Blocked” by bringing educational opportunities to under-served communities through innovative outdoor environmental learning. He is also a regular contributing columnist to The Washington Post and Time Magazine, and a best-selling author of literary fiction and non-fiction books. On November 23, 2016, he was awarded the Presidential Medal of Freedom from President Barack Obama in recognition of his outspoken advocacy of social justice. The CCAC, established by an Act of Congress in 2003, advises the Secretary of the Treasury on theme or design proposals relating to circulating coinage, bullion coinage, Congressional Gold Medals and other medals produced by the United States Mint. The CCAC also makes commemorative coin recommendations to the Secretary and advises on the events, persons or places to be commemorated, as well as on the mintage levels and proposed designs. The CCAC is subject to the authority of the Secretary of the Treasury. The United States Mint is responsible for providing necessary and appropriate administrative support, technical services and advice.